No more sleepless nights wondering if you backed up your files before you left the office, no more keeping fingers crossed that the worst case scenario won’t happen – with our cloud backup we have you covered. Human error, natural disasters and intellectual theft are just some elements that every business should take seriously and have a protection plan in place. Data recovery from stolen or damaged systems is time-consuming, expensive and paralyzing to your business. How would your business cope with unforeseen disasters? What if you lost or accidentally deleted important documents and files? Have you thought about how this would affect your business? We have. We’ll provide the protection your business needs. One solution for disaster recovery, backup and critical business data protection. 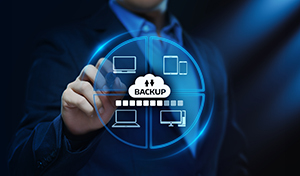 Our Cloud Backup Service provides reliable, secure, backups of your desktop, laptop or server computers to a remote location via the Internet. The security of these backups is never compromised, as your data is encrypted both for transmission over the Internet and for long-term storage on our backup servers. We even keep a large number of previous versions of your backed up files, meaning your data can almost always be restored — whether recovering a file you saved minutes ago, or an old copy of a file created months ago.